When your best friend is just a tiny bit psychotic, you should never actually believe him when he says, "Trust me. This is gonna be awesome." Of course, you probably wouldn't believe a voodoo doll could work either. Or that it could cause someone's leg to blow clean off with one quick prick. But I've seen it. It can happen. 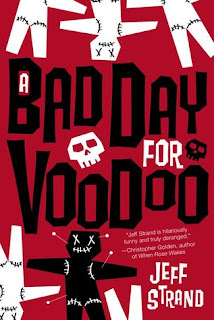 Wow, A Bad Day for Voodoo definitely isn't your run of the mill novels. It was unlike anything I have ever read before. I haven't ever read a novel where tongue-in-cheek comedy was a big focus. I have read novels with comedy sprinkled in here and there, but never one where comedy is your main genre. It was definitely interesting and a big change of pace. I definitely wasn't sold by it, though. I am not a new converted comedy novels fan, but it was different and I did enjoy reading it. Will I be super speedy to accept the next comedy novel that might pass my way? Probably not, but I know now what to expect from a comical novel. I think before anyone goes out and reads A Bad Day for Voodoo you need to know that it is supposed to be a comedy. I kind of got the impression (I don't know how I got this impression lol) that it would still be a more suspenseful/serious novel with comedy sprinkled in, but it isn't. And going in with that impression I was constantly looking for the seriousness. I think I would have had a better experience if I knew right away that this is sole-y a comedy and to just relax and laugh lol. So I just wanted to point out to all of your potential readers now to relax and laugh. We read a lot of serious novels and sometimes it is hard to do that. Even though I am very used to dramatic novels this was a nice change of pace. The comedy is pretty hilarious and I did laugh a lot. There isn't anything inappropriate for teens which I really enjoyed. Sometimes people go too far when trying to make a joke, but Jeff did it really classy and tasteful. Its a light-hearted novel, not heavy at all. I enjoyed the characters that Jeff created as well. Tyler and Kelley are my favorites, mostly Kelley because she is the only level headed person in this novel (duh, cause she is a girl!). Adam I wanted to kill most of the time, but that was the point so great job on that Jeff. The villians through the story were also very different. You had your typical villians (teachers, thugs, junkyard worker), but then Jeff also created a whole different kind of villians as well that you might not find in your everyday life. I would tell you examples, but that would ruin the story. I think A Bad Day for Voodoo was ok. I'm not used to just relaxing and laughing at everything so it was definitely a big change in reading for me. I did like the story, though. It was very light-hearted and I loved that it was completely appropriate for teens. No joke went too far. The characters and villans that Jeff created were very unique and created very well. I wouldn't have changed the characters in any way. I was definitely not converted into a huge comedy novel fan, but now I know what to expect from one if I choose to read another one. I recommend this to those who love comedy or want a nice light change of pace. 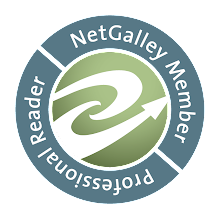 Great review, i generally do not read this type of book either...but Jeff sounds hilarious. Yea, he is definitely hilarious, but like you it just wasn't my thing so I didn't fall head over heels with it. This might be the funniest book I've read this year. I Love Jeff Strands comical writing style! It makes what should be a grisly scene into a humorous one.